My first “official” zine was actually made for a class back in early 2010, and it was about perception and eye contact through a webcam. But I don’t know, I have been making my own little comic books since I was 11 or 12 (so like 2001-2002), so maybe that counts? Those were mostly about super powered anime space princesses. I’m in the process of finishing up a coloring book/memoir comic about the punk scene in my hometown. I’m hoping I can find a good way to package it with crayons. Ahhhh, I don’t think I have one favorite. I like a lot of little things I have made for different reasons. 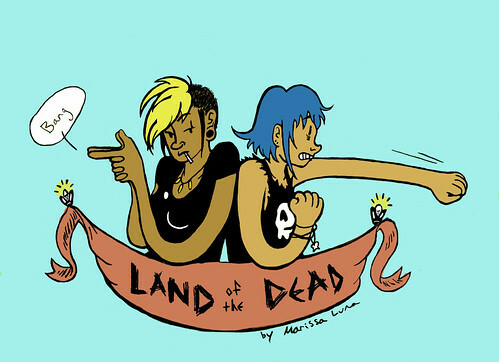 I guess one thing I am really happy with is the covers for the first issue of my series “Land of the Dead”. It’s a seven-layer screen print with a (very faint) glow in the dark layer. Liz Suburbia: Probably the biggest influence in the way I approach my work in recent years. She has a wonderful playfulness (maybe that’s not the right word, humor? not-so-seriousness?) in the way she approaches thoughtful or tender subjects. That really inspired me when I first discovered her. John Porcellino: I really like the idea that zines and comics can be very minimal, but very powerful. Like trying to say a lot with a little. 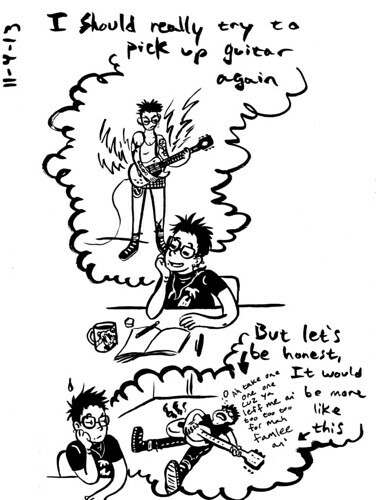 I also found my love for making autobiographical work from him. I got the opportunity to intern with John P about a year and a half ago, and although it was a very short internship, I think I learned a lot about what it’s like to have devoted so much of your life to making things you love. Naoko Takeuchi: Okay, so I always have to mention her. Sailor Moon was the first comic I read as a kid, and without it’s existence and success, I may never have developed my love for comics, and from that, my love for zines. Usually, working an awful day job, reading dumb stuff online, watching cartoons, talking to my friends who all live hundreds and hundreds of miles away from me. Things like that. All of those things have their pretty obvious positives and negatives. Y’know. Check out more from Marissa Luna online!